A cochlear implant is an electronic device that restores partial hearing to individuals with severe to profound hearing loss who do not benefit from a conventional hearing aid. It is surgically implanted in the inner ear and activated by a device worn outside the ear. Unlike a hearing aid, it does not make sound louder or clearer. Instead, the device bypasses damaged parts of the auditory system (cochlear)and directly stimulates the nerve of hearing, allowing individuals who are profoundly hearing impaired to receive sound. 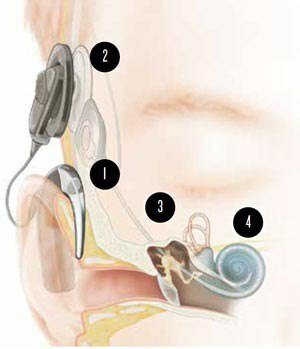 A cochlear implant has two main components: an internal component that consists of a small electronic device that is surgically implanted under the skin behind the ear, connected to electrodes that are inserted inside the cochlea and an external component, usually worn behind the ear that consists of a speech processor, microphone, and battery compartment. When Will I Start Hearing? 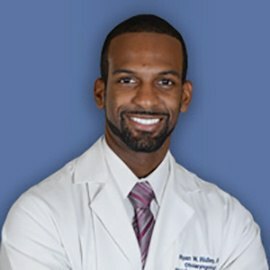 About a month after surgery, the doctor places the signal processor, microphone, and implant transmitter outside your ear. This is the first time that you will hear after the surgery. You will learn how to look after the implant and how to initially listen to sound and make adjustments. Some implants take longer to fit and require more training. You may have to make additional to the doctors office for follow up checkups and readjustment of the speech processor as needed. How does a BAHA system work? 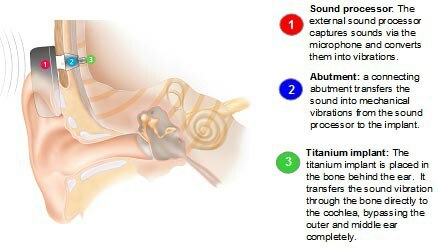 The system works by taking the sound from the outside and transmitting it to the inner ear through the bone. This bypasses the ear canal and the middle ear. 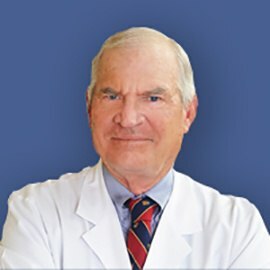 A titanium implant is placed during a minor surgical procedure and over time integrates with the bone behind the ear. The hearing device transmits sound vibrations through the titanium implant to the skull and the inner ear – where the hearing takes place. 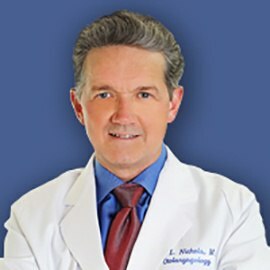 We have otolaryngologist hearing specialists that work in different offices. So call 281-649-7000 to schedule an appointment in a clinic nearest you to determine if you are a candidate for a Cochlear Implant or BAHA system.